Man, it's hard to believe that it is mid-June already... The past couple weeks have gone by so fast. Summer is definitely here, and with it has come a lot of busyness. Marianne and I have been doing a lot of work around the house lately, and also some traveling... to a friend's wedding on the island of St. Lucia (unfortunately no fishing involved... bummer!) I seriously wish that I had a lot of success and big fish reports to share from the past couple weeks, but the fact is I've only been on the water twice. First, was a quick evening trip that I made to the Juniata a couple weeks ago with my good fishing buddy Mike. Mike and I fished some excellent water that has produced some great results for us in the past, but we only scored just a couple of small fish each on this trip. The water was still pretty cool and slightly dingy from recent rain. I think the flow was a little bit more than optimal for the area that we targeted as well. The few fish that we did catch were on top, with soft plastic jerk baits. 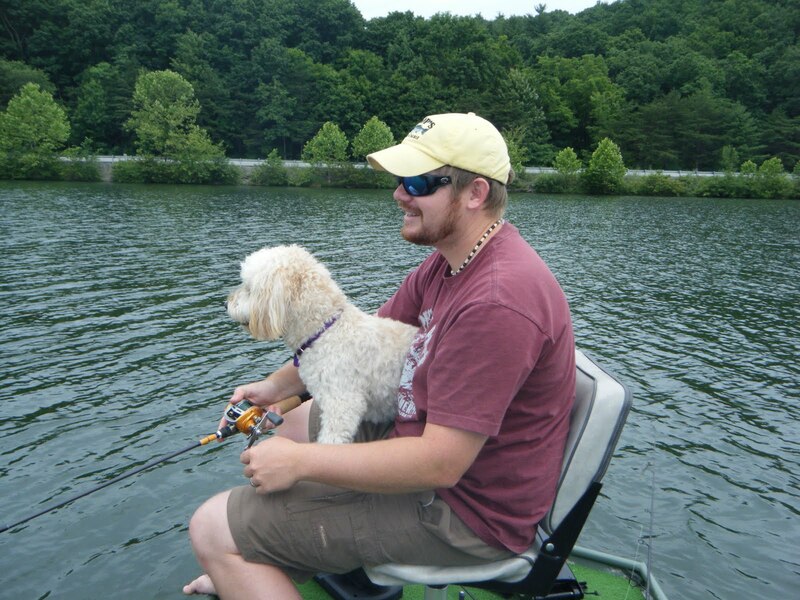 Second, was a nice trip that I made with two of my other favorite fishing buddies... my good friend Chad and my best pupper-dog, Lucy. 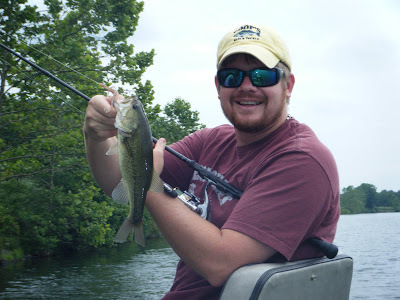 We trailered the boat to one of our local lakes, and spent about 5 hours motoring around fishing various edges, shoreline structure, and creek channels--targeting largemouth bass. We caught a lot of fish with both of us easily in the double digits... 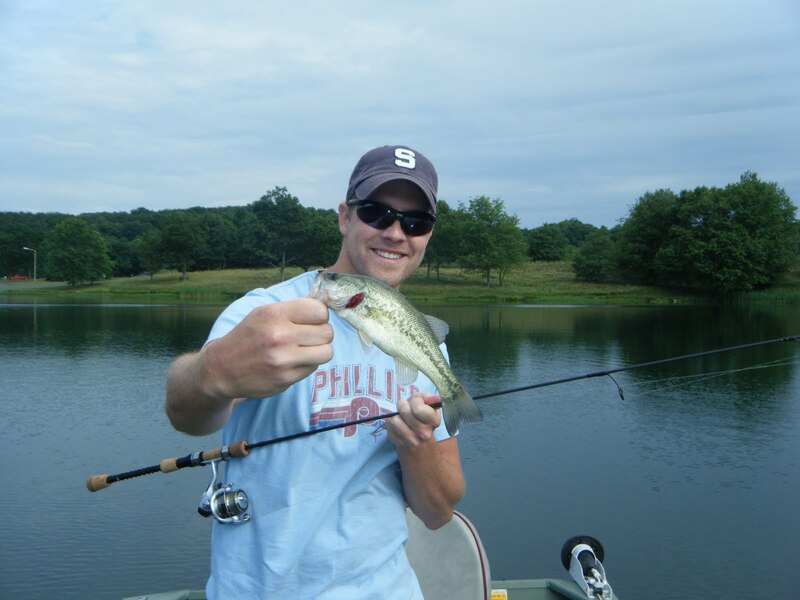 Most (well actually "all") of the fish were small, with the largest being around 12 or 13 inches. 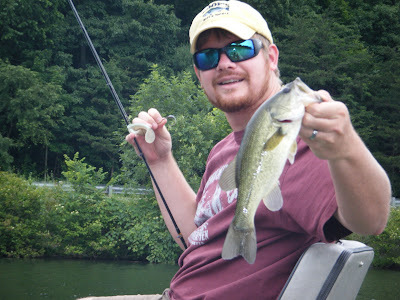 Our fish all came on a variety of soft plastic lures--jerk baits, swim baits, and lizards. Probably the greatest highlight of the trip (at least for me) was finding out how well Lucy could swim, lol. Lucy was standing with me on the front deck as I was fishing and operating the trolling motor. Suddenly, as if on a whim, she decided to leap out of the boat and into the water. She is still a pup, and we really haven't had her in the water defore... but I was happy to see that she had no problem swimming. She doggy paddled a little loop away from the boat and then came back to me... with a lot of yelling of coarse, ha ha. 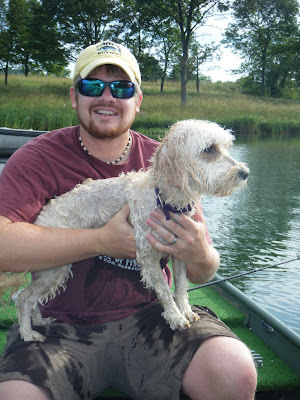 When she got back to the boat I picked her up and pulled her back in where she decided to sit on my lap shake herself off and totally soak me... Oh what fun, lol! In spite of her few moments of misbehaving, she was great the rest of the day and was a lot of fun to have in the boat. She's gonna be a great fishing buddy. Well, I guess that is all for this entry. Hopefully it won't take me quite so long to get back to you with the next one. As I mentioned before, summer is definitely here. 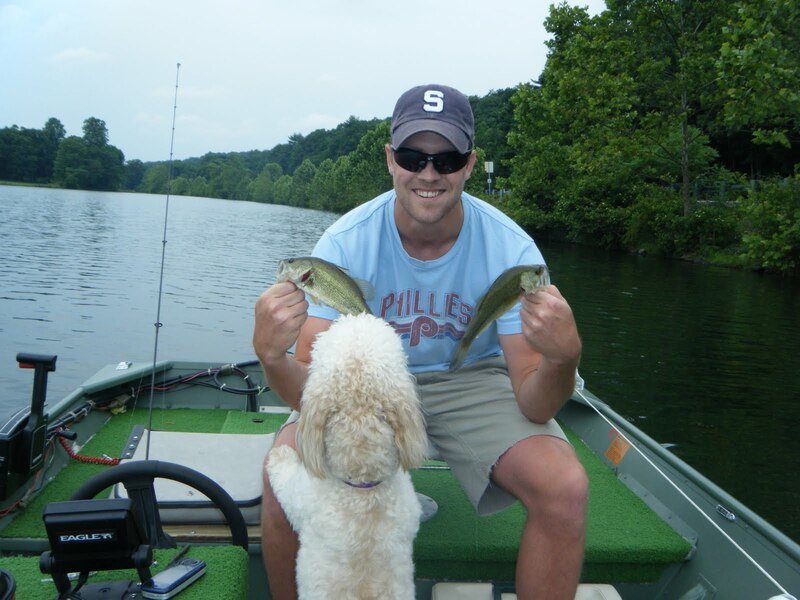 Most of the chores are done around the house, and I am planning to do a lot of fishing this summer... I should finally get to do some saltwater fishing soon, and I'm also hoping to spend a decent amount of time targeting muskies this year. So with A LOT of luck maybe I'll have some great toothy fish action to share with you this summer. Keep your fingers crossed for me. Until next time, thanks for reading and good luck on the water. Maybe I'll see you out there!